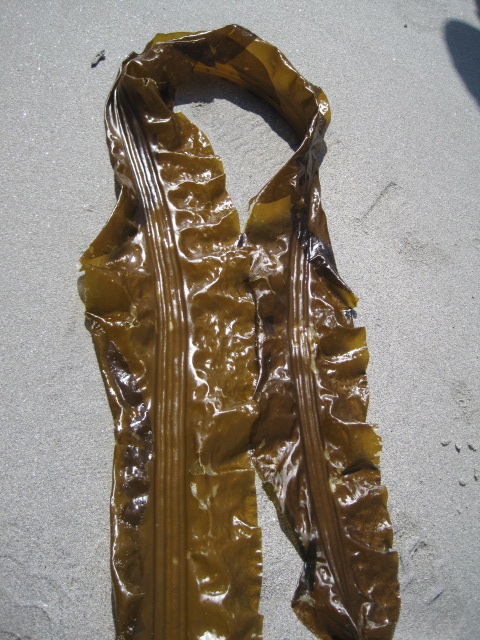 Three-ribbed kelp found on Calvert Island shorelines. Photos by Jenn Burt (top and bottom left), Gillian Harvey (bottom right), and Joel White (top right). Three-ribbed kelp is composed of a single blade (to 4 m long and 18 cm wide) attached to an unbranched stipe (to 25 cm long). It has a simple, disc-shaped holdfast. It ranges from yellowish-brown to reddish-brown, and is lighter in colour than most kelps. It gets its name from the three central distinctive folds (or ribs) that run along the length of the blade. These folds range from fairly shallow to 2.5 cm deep; the older the individual, the deeper the folds. This species has a sweet, cucumber-like scent which is often discernible from a distance, and is unmistakable when a blade is torn and the severed edges are sniffed. 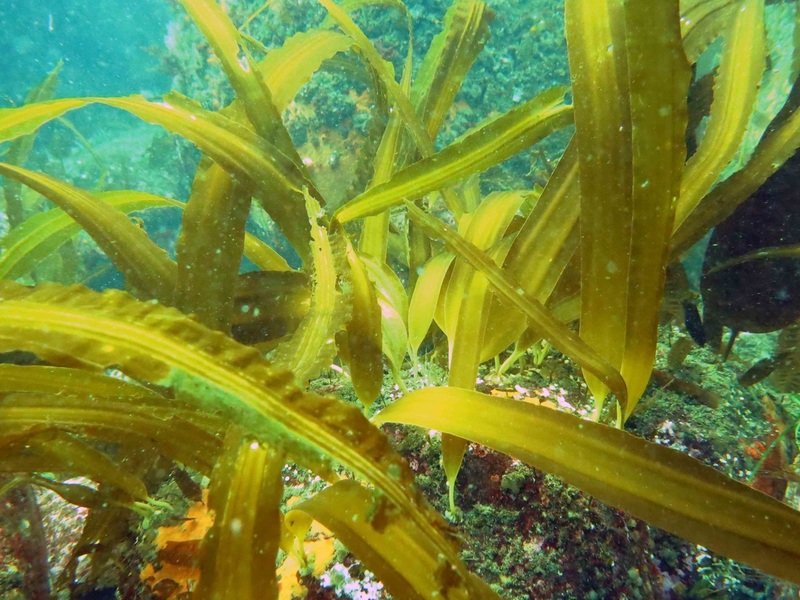 Three-ribbed kelp grows in lower intertidal and upper subtidal areas in both inshore and more exposed outer coastal waters. It is found along the coast of the northern Pacific, from the Kurile Islands in Russia east along the Bering Sea to Alaska, and south along coastal BC to northern Washington. Five-ribbed kelp (Costaria costata) has five rather than three ribs running the length of its blade. It tends to be shorter and wider than three-ribbed kelp (the blade grows to 2 m long and 35 cm wide), and the ribs spread out along the width of the blade rather than grouping in a central strip like in three-ribbed kelp. Five-ribbed kelp also has a branched holdfast, whereas three-ribbed kelp's holdfast is unbranched. 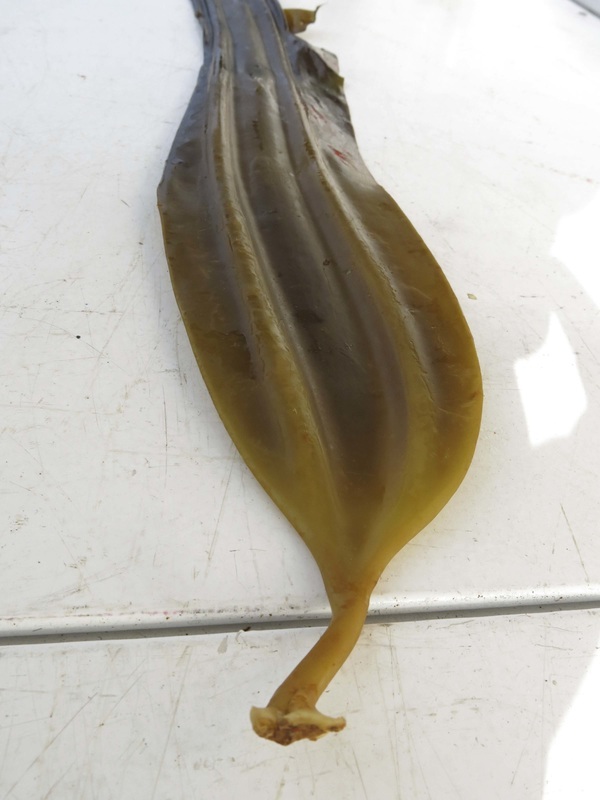 Lab tests on three-ribbed kelp from southern BC and Washington shows that the upper temperature tolerance of these individuals is between 15 and 18°C, which is the lowest of any algae species found in that region. O'Clair, R. and Lindstrom, S. Costaria costata (Turner) Saunders. In Klinkenberg, Brian. (Ed.). E-Flora BC: Electronic Atlas of the Plants of British Columbia. Lab for Advanced Spatial Analysis, Department of Geography, University of British Columbia, Vancouver. Accessed 16/09/2013. O'Clair, R. and Lindstrom, S. Cymathaere triplicata (Postels et Ruprecht) J. Agardh. In Klinkenberg, Brian. (Ed.). E-Flora BC: Electronic Atlas of the Plants of British Columbia. Lab for Advanced Spatial Analysis, Department of Geography, University of British Columbia, Vancouver. Accessed 16/09/2013.